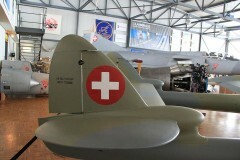 Mirages and other Swiss Air Force aircraft can be seen in the Musée de l’Aviation Militaire de Payerne in Switzerland. The Clin d’Ailes Swiss Air Force Museum in Payerne offers a pleasant surprise in a region better known for its cycling and hiking routes, water activities, Roman sites, and medieval towns. Adjacent to the Payerne Air Force base, this small modern museum exhibits military aircraft and equipment from the second half of the twentieth century. 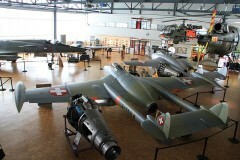 The Clin d’Ailes Museum of Military Aviation allow visitors to come close to Swiss Air Force planes and jet fighters from the past sixty years or so. The planes are the main attractions and most are accompanied by short videos showing the planes in flight – generally training flights as the Swiss Air Force hardly ever had the change to fire a shot in anger. Historic equipment on display ranges from ejector seats to radio equipment, flight simulators, models, and photos. A small section is dedicated to Claude Nicollier, Switzerland’s first astronaut. Historic flight simulators include rather primitive-looking wooden planes to more modern electronic wonders. 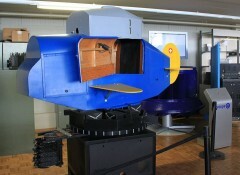 Visitors may use the more modern computer game to try and fly a plane. In addition to the planes on display, the museum also has two obsolete air force jets that are still flying: a Hawker Hunter Trainer TMk.68 and a Dassault Mirage III-DS “EMIR”. These two ex-Swiss Air Force planes are two seaters and it is possible to be a passenger on a flight. The main condition is that the passenger pays for the fuel. Prices start from around CHF5,000 for 25 minutes in the Hunter to CHF17,000 for 45 minutes in the Mirage, presumably payable in advance. Flight days and the number of flights are restricted and often oversubscribed – see Flight Operations for details. 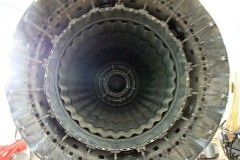 The Clin d’Ailes Musée de l’Aviation Militaire de Payerne is open from 1:30 to 5 pm from Tuesday to Saturday in July and August, Tuesday to Sunday for the rest of April to October, and on Wednesday and Sunday only from November to March. It is often closed on public holidays and for two weeks at the end / start of the year. Admission is CHF10 for adults, CHF5 for children 6 to 16, and CHF25 for families. The Swiss Museum Pass is valid. The museum is best reached by car. From Payerne, follow the road towards Grandcour (and Vallon). 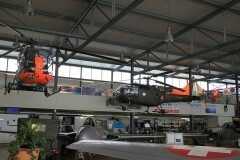 The museum is to the north of the aerodrome – free parking behind the shed just past the museum building.